Posted on August 8, 2018 by DanielC. Taking place in beautiful Venice, Prosper and his little brother Bo are running away from their evil aunt Esther. They ran away because Esther is planning on separating the two boys, keeping Bo and sending Prosper off to boarding school. But, the two manage to escape and run away into the land that their mother always told them about, Venice. Luckily, the Thief Lord, or Scipio, take them under his wing along with a few other children. The rugged band begin to steal valuable items to sell to make a living. A mysterious man, the Conte, asks them to steal a wooden wing for a very high amount of money. Of course, the children agree and start their hunt for the wing. The novel follows Prosper’s struggles to take care of his brother while still trying to participate in the wing hunt. Deeper into the book, you realize that the Thief Lord is actually the son of a wealthy man, and has been stealing his own father’s money for the group! The children begin to distrust the Thief Lord and decide to steal the wing on their own. What I really liked about this book was how independent the children were and how they could make a living by themselves. My favorite character was definitely Bo because he reminded me of myself; a reckless, teasing, little brother. My favorite twist is when you find out the Thief Lord is the son of a rich man because it is so surprising. Exciting and surprising, The Thief Lord written by Cornelia Funke is an enchanting novel for middle school readers. It contains many twists and turns that will leave you wanting to read more. This is one of the best mystery novels that I have read and I am planning on reading the sequel when it comes out! 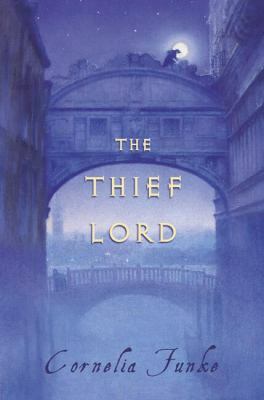 The Thief Lord by Cornelia Funke is available for checkout from the Mission Viejo Library. This entry was posted in Book Reviews and tagged brothers, family, outlaws, robbers, runaway children, siblings, thieves by DanielC.. Bookmark the permalink.